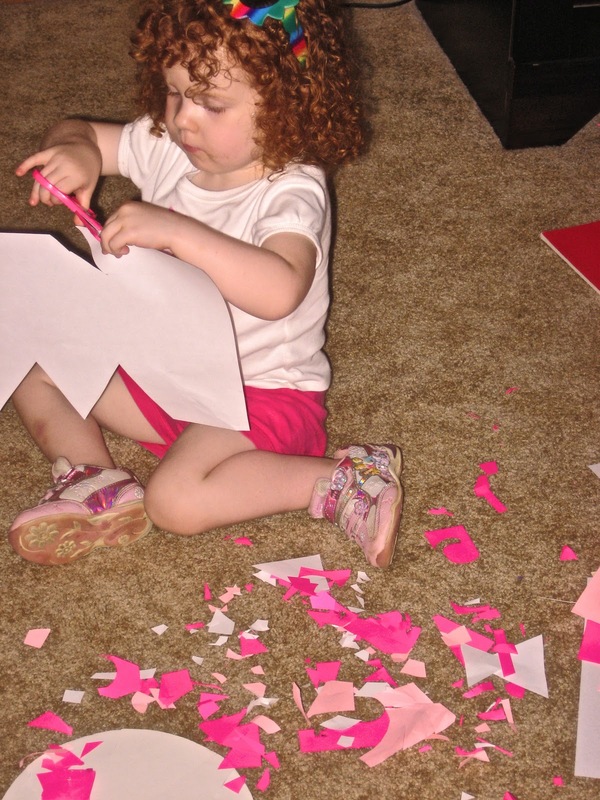 When my daughter was 2 1/2 or so, I introduced her to scissors and cutting paper. I do remember letting her cut play dough snakes which is also a great pre-cutting paper activity!!! Just roll out some snakes and let your child practice cutting them and I guarantee you will have little bits of play dough all over! They won't want to stop!! I would just give her paper and scissors and let her cut, cut, cut away with supervision. I believe this is one of the reasons she is really quite good at cutting paper! Her preschool teacher is very impressed with her scissor skills. I know some parents cringe when they think of their little one using scissors, but a child has to be able to experiment with scissors (just like drawing or painting) to develop their skills and build confidence! Here is Cassie (almost 3) cutting away!!!!!!! I'm not a huge fan of the pre-made cutting activities and workbooks, but believe they can serve a purpose to develop skills. I admit I have purchased Kumon and Gakken Cutting workbooks because my daughter absolutely LOVES them! She actually loves the Maze and Counting workbooks too! They are so colorful and fun and they are good to do once in a while! They are not a substitute for Creative learning!!!! My daughter can complete these workbooks in a days time----she has a lot of fun with them! And wanting more! This particular Gakken Cutting Workbook (I Can Cut!) had a crown, a race track, pizza set, wrist bands, and more...it was pretty cool! If it develops her skill a bit more then, why not? We will back to more creative projects soon..... What do you think???????? I am now following you! Thanks for the help! 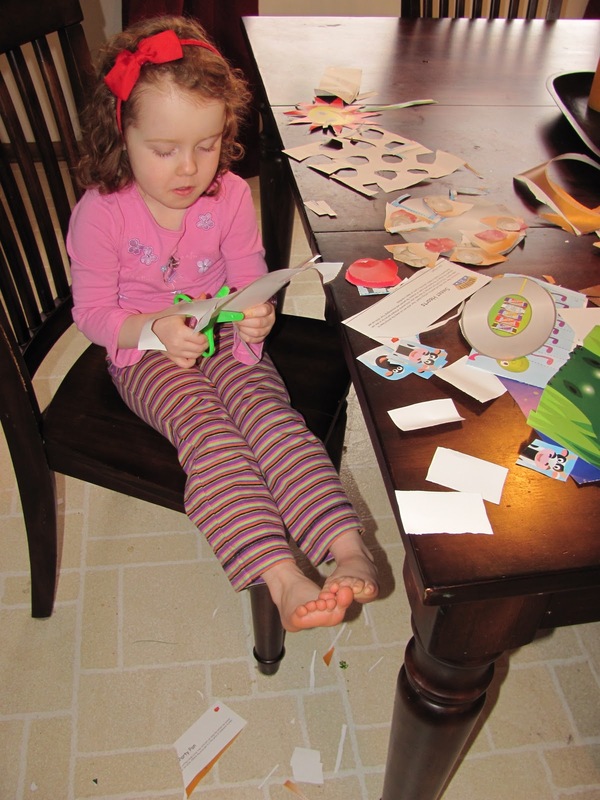 I also allow my 21/2 year old children to use scissors, and they LOVE snipping, and snipping. I also don't help them unless they ask, but I feel that with time the child will find his/her own perfect style of using scissors. We also have a small broom and dustpan for sweeping bits into the recycle box, as my kids can sometimes spend up to 40 minutes cutting for the pleasure, with lots of the most minute scraps of paper. 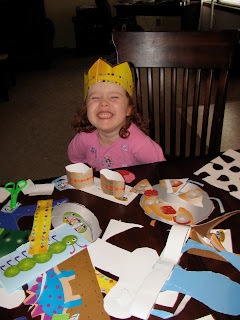 Sometimes the kids move onto gluing scraps on paper to make creations, but that is totally up to them. I leave scissors, in a small basket, on the art shelf, beside a small basket of glue, and the children use them as they chose. I have taught them safe ways to hold the scissors when walking, and request that they stay at the table with their cutting. I sometimes have toddler aged children visit my room, and it depends on the child if I keep the scissors on the shelf. I know each toddler well, and sometimes chose for safety to put the scissors up out of reach if need be. Good pictures, I agree kids like all sorts of opportunties. Thanks for all the feedback!!! My daughter is 4 now and loves to still cut like those 2 1/2 year olds you are describing! 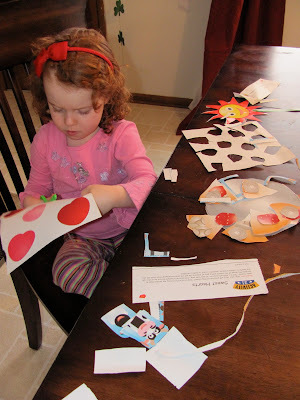 We would use all the small pieces for collage. You can tell when older children haven't had opportunities like these-- because they will jus cut for the sake of cutting too! My daughter uses her right hand to cut with even though she writes and colors with her left! Claire never liked cutting until about 2 weeks ago, now we have a dedicated "snipping box" with scrap paper and ribbon and she's going to town on it. She's got this funky way of gripping the scissors but it seems to work for her at the moment so I won't push too much. Those workbooks look like fun, I don't think they're a bad idea if your daughter is loving them so much. I have an idea to extend them and make it a bit more creative but I'm going to have to find a version of them first to check them out. Looks like I'll have to stop at the teacher store in town! That is great that she is interested in cutting! If she sees you using scissors--she will be drawn to them! 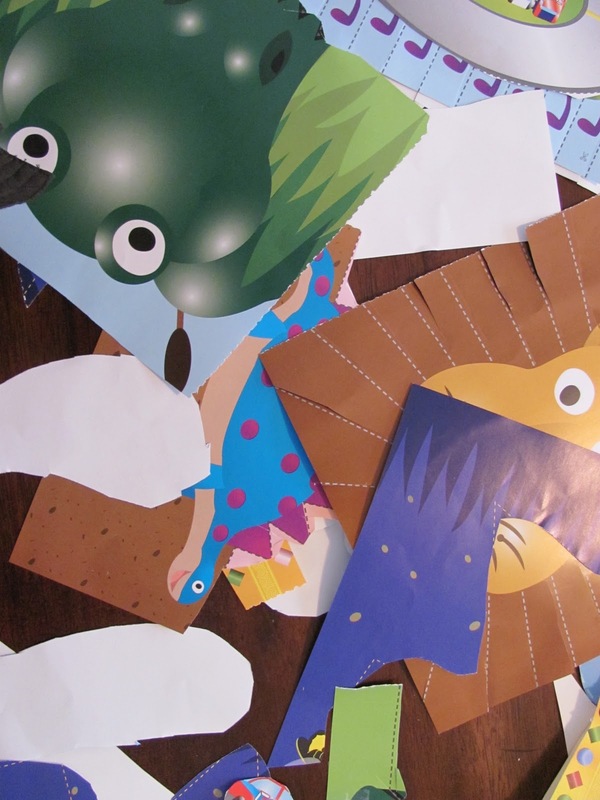 We do a lot of cutting activities so I am not worried about these cutting activities---I just didn't want to overly promote them as the only way to learn. The best way is to just let them to have free expression with scissors and give some ideas! What a cute post! My 3 year old can spend hours cutting things into teeny tiny pieces :O). She LOVES them! I'm excited to look through the rest of your blog! Hi Aly! Thanks for stopping at my blog! I introduced scissors to T somewhere around the age of 2, but she's only JUST starting to get really good with them. I used to put a ton of paper strips in a basket, so she'd only have to snip once to get a bit of paper off. This really encouraged her rusty first attempts! Charlotte is obsessed with using scissors, she has her own pair of preschool scissors that she hates using she always wants to use Mommy's sharp scissors. I'm done battling with her over it and just supervise her very carefully, she does great with them. We also use the Kumon cutting books, I've never tried Gakken, will have to look into those. Thanks for posting!